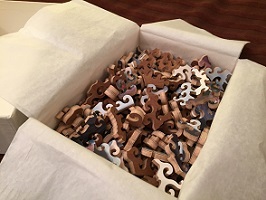 Welcome to the wonderful world of hand-made wooden jigsaw puzzles. My name is Conrad Armstrong, and I've been cutting puzzles for fun, for my family and friends, and on commission, as a hobby for years. Hand-cut wooden jigsaw puzzles are a whole different experience than today's cheap cardboard puzzles. I consider my jigsaw puzzles as art that can be assembled and enjoyed over and over again. A wooden jigsaw puzzle is extremely strong and will not bend or break when put under the same stress that breaks cardboard puzzles. Wooden jigsaw puzzles which were cut in the 1920's are still being used today; I like to think that the hand-made puzzles I cut today will become family heirlooms to be enjoyed for many decades. My puzzle pieces look nothing like typical jigsaw puzzle pieces; each piece and each puzzle I cut is unique. I try to make the shape of each piece interesting by itself. My cutting style adds to the overall beauty of the puzzle when assembled. For the picture, I usually use a print or poster that was purchased by me or by someone who has commissioned me. I don't just cut any picture; I only choose pictures that I think will make an interesting puzzle, and one that I think I can do something creative and "interesting" with.